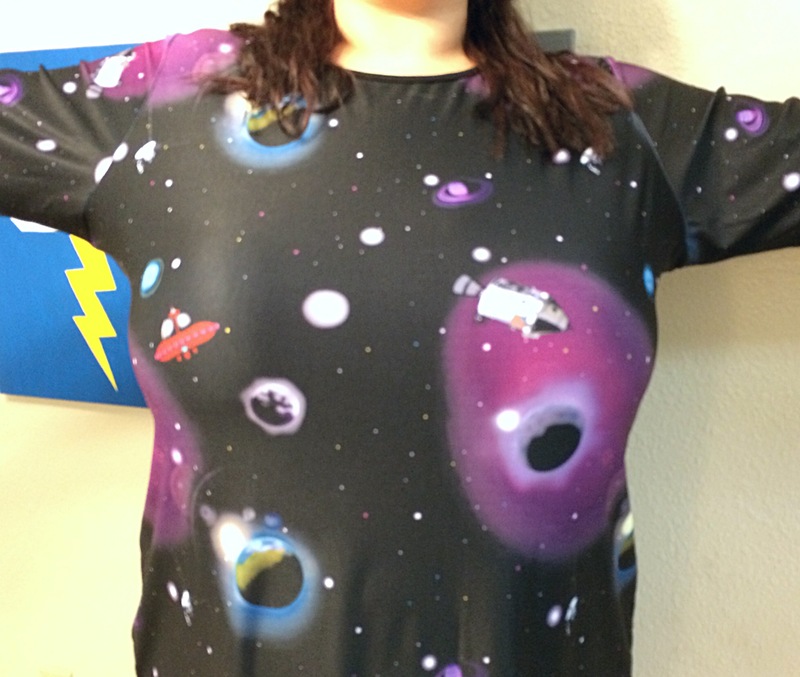 A few months ago I saw this dress (http://www.modcloth.com/shop/dresses/satellite-the-way-dress) and I knew I had to have it. 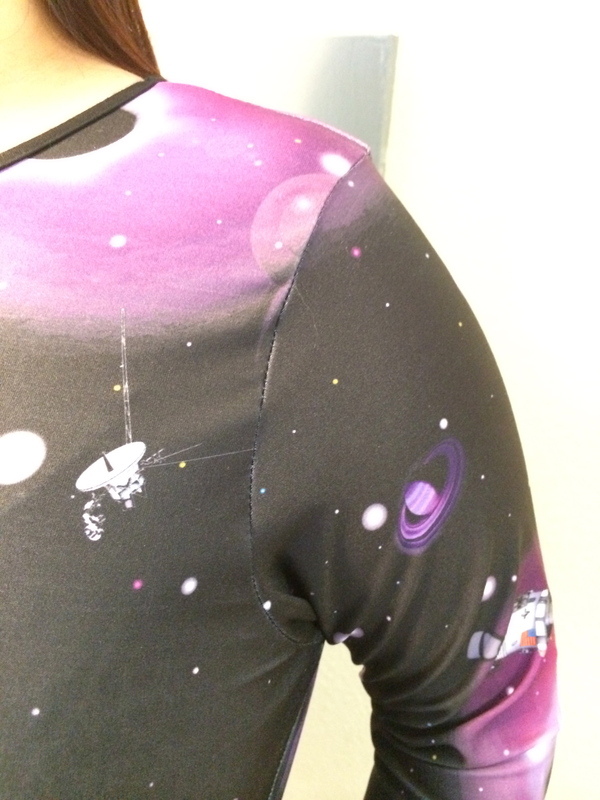 You must know that I LOVE all things space related so it was a no brainer…this dress WOULD be mine. It was marked down from $52.99 to $15.99 but my size wasn’t available so I opted for 2 sizes larger. BIG MISTAKE. 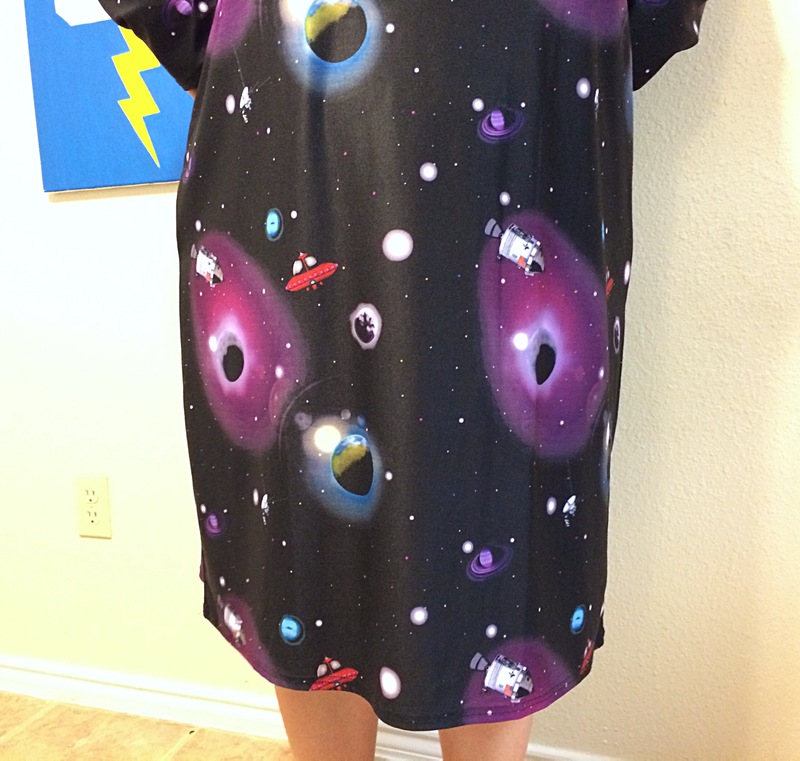 It was HUGE on me, like a muumuu. THE HORROR! Since it looked like crap on me, I decided to turn it into separates. I haven’t done alterations to a garment before and without a dress form, it’s a nightmare. Luckily my husband humored me and put the dress on so I could at least shorten the sleeves and armholes. Look at that droopiness! So ill fitting! 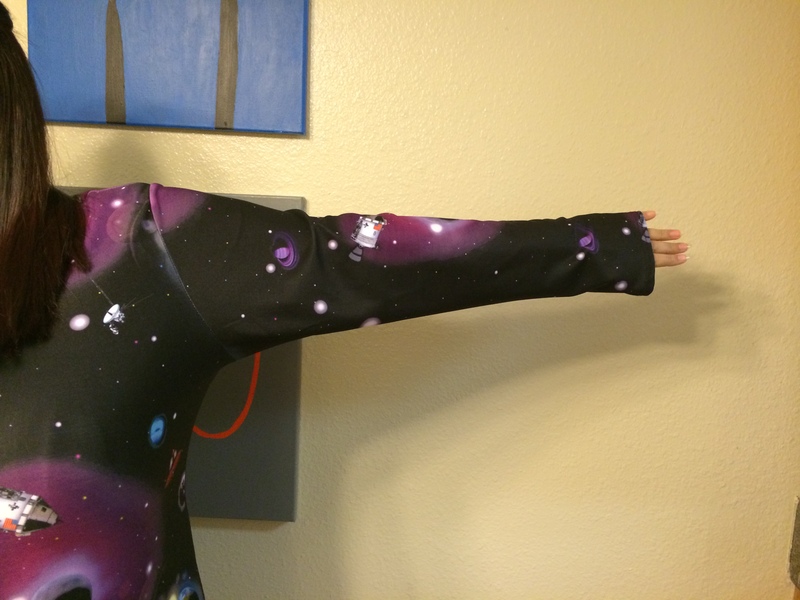 And of course, the sleeves were really long. Now it’s much more form-fitting and I don’t feel gross in it. 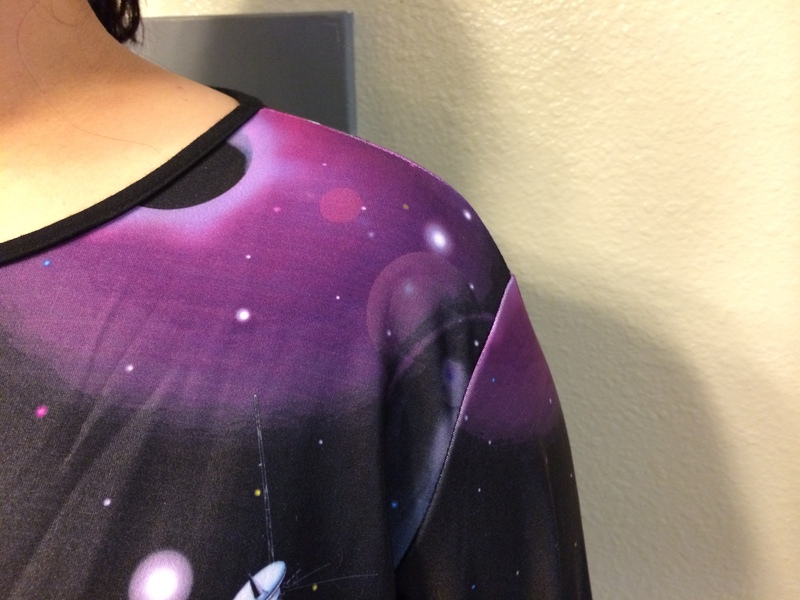 I used black bias tape to hem the shirt since I cut it a little too short. Sleeve is looking much better now! It would be really easy to make a skirt out of the bottom of the dress since it’s already a rectangle, but I’m not sure yet. Until next time, happy stitching! 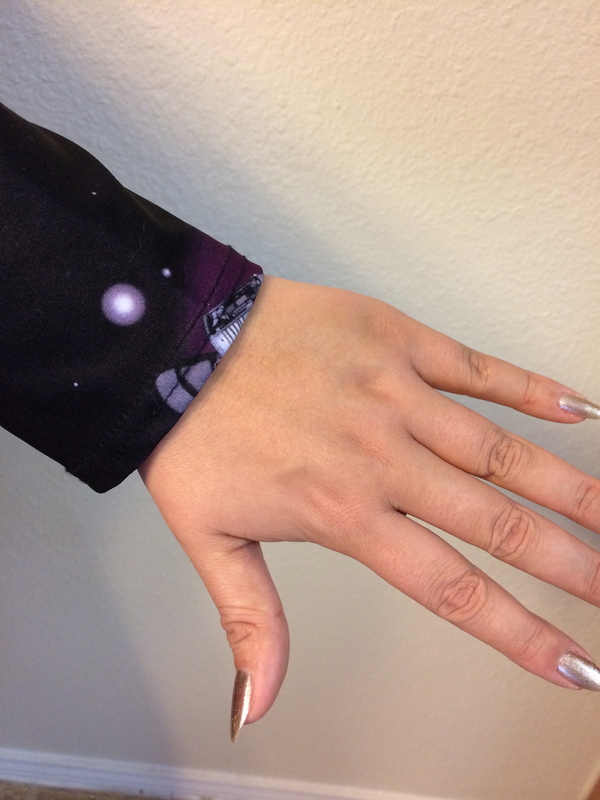 What a fun fabric and good solution to get it to fit. Perhaps you could also squeeze a sleeveless top out of the bottom piece. That’s a really great idea! Thank you:). So…where are the pictures of your husband in this dress, eh? Eh? Next time we want pictures of hubby! Great job! LOL I’m sure he’d HATE that! Awesome job sis! Proud of you!